This ‘Man of Steel’ poster certainly raises a ton of questions. It definitely looks good, but is very strange. 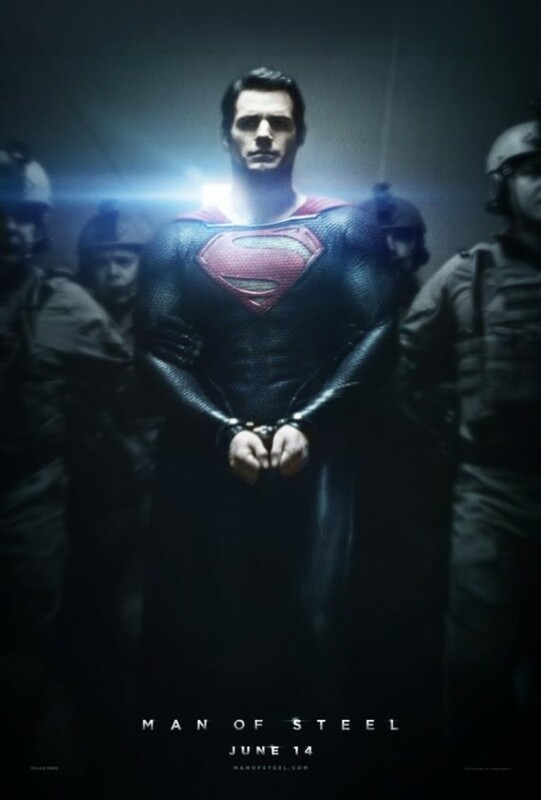 Here we see Henry Cavill as Superman being escorted by military personell in handcuffs. Is Supes a bad guy? How is this possible? Superman is invulnerable to pretty much anything and could fly away and break those handcuffs, and if the military guys try and shoot him, you know the bullets would just bounce right off. But who knows? We can expect the 2nd trailer to be attached to ‘The Hobbit’ trailer as well, which promises much more footage. And if you look at this poster, it almost looks like a noir film, what with the lighting and all. I’m very curious to see what Zack Snyder does with this film. I hear we won’t be disappointed. Your thoughts? Film opens June 14th, 2013, and watch out for the 2nd trailer. This entry was posted on Tuesday, December 4th, 2012 at 11:17 am	and is filed under Comics, Film, News. You can follow any responses to this entry through the RSS 2.0 feed. You can skip to the end and leave a response. Pinging is currently not allowed. My thoughts: Henry Cavill in spandex automatically makes this movie awesome. Don’t be shy now. Tell us how you really feel. Hey, the site is Boomstick Comics…not Boomstick Comixxx. Anything goes here, you know the rules. We say yes to everything. « Check Out the ‘Star Trek Into Darkness’ Poster!!! Use the comlink? Oh my! I forgot, I turned it off. [interrupting] Will you shut up and listen to me! Shut down all the garbage smashers on the detention level, will ya? Do you copy? Shut down all the garbage smashers on the detention level! Shut down all the garbage mashers on the detention level! [to R2-D2] No! Shut them *all* down, hurry! What? HAHA! Hey, you did it 3PO! Listen to them, they're dying R2! Curse my metal body, I wasn't fast enough, it's all my fault! My poor Master. 3PO, we're all right! We're all right! Ha ha! Hey, open the pressure maintenance hatch on unit number... where are we? 3263827!